Let's hope it's cheaper than Acer's Predator 21 X.
Microsoft's message to its hardware partners is clear—come up with "cool" designs and build more gaming PCs in 2017. Well, if it's innovation Microsoft wants, Intel may be the one to oblige with a laptop sporting a detachable curved screen display. The U.S. Patent and Trademark Office (USPTO) granted Intel its requested patent for such a device, as was discovered by The Leaker. 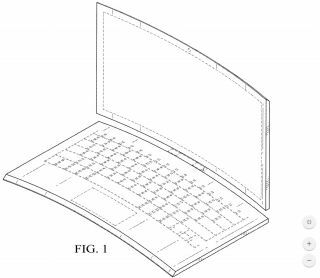 There are several diagrams visible in the patent application that show the laptop from multiple angles. Each one highlights the curved aspect of the 2-in-1 device, both the display portion and the base of the chassis. This is not the first time we've seen a laptop with a curved panel. Acer used one on its Predator 21 X that it showed off at CES earlier this year. However, that beastly configuration rings up at a dollar shy of $9,000. It's also big, presumably heavy, and doesn't allow for the screen to detach. It is a bit of an odd design. One angle seems to indicate that the keyboard is curved, though another diagram shows it with straight edges. It's not clear if perhaps the keyboard might bow so that only the edges make contact with the surface. That doesn't make a lot of sense to us though. To our knowledge, there are not any curved tablets out there, so that would be another first here (when detaching the display). We're not sure what the upshot would be—perhaps a curved display would rest easier on a lap?—but apparently Intel has something in mind. The patent also suggests that Intel is thinking about building its own hardware. If that is the case, it will be interesting to see if Intel goes the gaming route with discrete GPUs or highlights its own integrated graphics.